Clint’s quote is very revealing as it is important to understand that concealed carry for a women inevitably means making some physical adjustments and concessions. There may be times when it’s an inconvenience or a little uncomfortable, but this just comes with the territory. You are choosing to carry a serious piece of equipment on your person, and feeling it on your body is a healthy reminder to handle this awesome responsibility with care and respect. With time, you will feel naked without your gun on you, and if you are ever required to use it to save your life, believe me it will be well worth the little bit of discomfort. 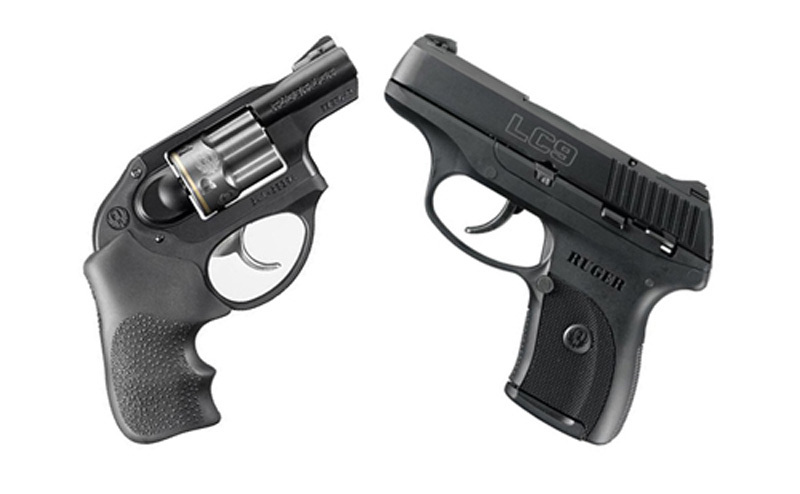 There are four key elements necessary for optimal comfort and safety that must all work together seamlessly for truly safe and effective concealed carry. The process of addressing each of these is what I call the building of a Personal Concealed Carry System. The four elements of a Personal Concealed Carry System are: the gun, the body, clothing, and the holster. Developing this system requires a thorough review and assessment of each of these and understanding how they each must work together. Women have some unique issues that must be addressed for each of these four key elements to build their individualized Personal Concealed Carry System. Choosing a gun is the most important decision you will make, as your gun is the central piece of equipment that all of the other parts of your Personal Concealed CarrySystem must work around. It should be the right size for you, fitting both your hand and your body as a whole and be one that you can shoot with confidence. It will become part of your body and your partner in your self-defense, so finding the right ‘match’ is the foundation of building your PCCS. Its size and weight must work with your body, clothing and holster. If your gun is too big and cumbersome to carry, you are less likely to carry it. Finding “your” gun doesn’t need to be so daunting. What makes it complicated is the combination of a new shooter’s natural lack of knowledge and lack of confidence mixed with the opinions and advice of others. The truth is, with some research, a basic knowledge of firearms, the consideration of the advantages and disadvantages of the options and how they might work as a component in your system, coupled with getting to try some, you will not only find the right gun for you, you will do it with confidence. So, stop looking for the gun that is somehow supposed to be the best for a particular gender based on some generalities that may or may not be true for you. When you find the right fit training will be easier, carrying will be comfortable, and shooting will be safe. Handle and shoot as many guns as you can and yes, it’s ok to talk to friends and family for additional input but instead of it dictating your purchase it will help you affirm your decision and make the best choice for you. A woman’s body is curvy, with bumps and bulges that must be taken into consideration and maneuvered around. A woman’s waist is typically shorter which can inhibit herability to draw; her hips are wider and sit at a different angle rendering many traditional holsters useless and her calves and ankles are smaller just to name a few. Now, I am not complaining about all of these ‘unique’ differences, we just need to learn how to find the ‘sweet spots’ and use them to our advantage. Body shape, size and physical limitations are all important factors. Let’s be honest, a 32A bust size will not conceal a GLOCK 19 in a bra holster very well nor will a 42 DD or a larger tummy allow for effective cross draw carry. Joint, muscle and other physical issues must be considered and their impact on concealed carry understood, as they will help you identify and determine locations that are reachable. 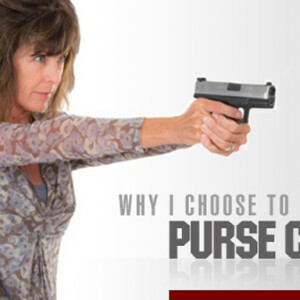 Your choice of clothing is critical if you intend to carry concealed. Your clothing not only needs to fit you, it needs to fit your gun. Women tend to wear more fitted styles and many of the fabrics we love can be thin and sheer. Dresses and skirts pose an additional set of challenges, as does the absence of a belt or strong waistband. To provide the security we desire, our gun must be close, accessible, and hidden from view. 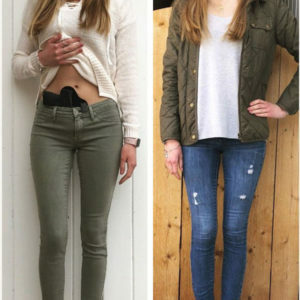 Again, we must look at how we dress and if it helps or hinders our individual ability to concealed and access our firearm. Men have it easy! Their wardrobe consists of pants and a shirt every single day. Only the style and fabrics change but their concealed carry location does not. Women on the other hand, wear a variety of different clothing styles each and every day that may require concealed carry in more than one location. Likely, some concessions and changes will be necessary but with a variety of holster options carried in some creative locations and some simple wardrobe adjustments, many of these challenges can be addressed. Think about how you dress most often and begin to plan your strategy. Wear low-rise pants to increase the length of space to draw. Buy pants and skirts with more room in the waistband to accommodate your new bulge. Wear flowing, looser shirts, especially for bra, belly band or underarm carry. 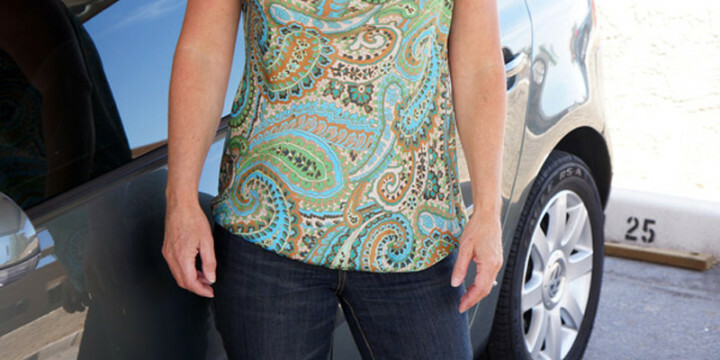 Integrate patterns into your clothing, they substantially hide and minimize any bulge or gun printing. Wear a little longer shirt, un-tucked. Wear a sleeveless light long vest. These are great for small of the back carry and depending on the fabric, can be worn year round. Slit the bottom of the pocket in a skirt or dress for quick access to a firearm holstered in a thigh holster. It is extremely important to note that with this variety of locations comes an increased commitment to training the draw from these different holsters and a heightened daily awareness of where the gun is holstered. During an attack is not the time to not know where your firearm is nor is it the time to learn how to draw from it. This is where, everything you have learned and now understand about the gun, your body and your clothing all come together to complete your Personal Concealed CarrySystem. We know just because a holster is pink is no guarantee that it was designed for a women’s body. 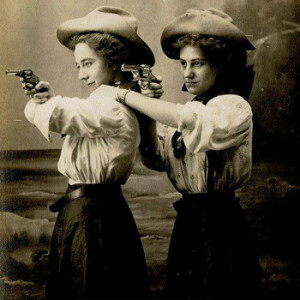 Finding a holster designed for a woman and one that works on her body can be extremely difficult. 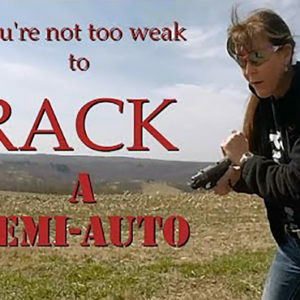 The Well Armed Woman has designed an exclusive line and has sought out the best options to help. A good holster is one that attaches to your body or clothing securely and retains the firearm properly, whether because of the material it is made from or with the use of retention straps. A good holster also fully covers the trigger guard, is one you can reach with ease and is comfortable. This is a very important piece of equipment in your self-defense plan; it has a very important job to do so the focus has to be first on performance, not appearance or sexiness. As obvious as it may sound, your ability to put it on properly and draw your firearm from it is key. I have seen some holsters that are so complicated to put on that you need to be a contortionist to or have the strength of a super hero in your hands to attach it. Another thing to consider is the thickness of a fabric type holster, it must be thick enough to keep your finger from pressing into the trigger guard area and pull the trigger during daily adjustments. So thin lacey fabrics are not good options. On the waist carry is not only the best location to carry because it offers easy access, it turns out it is now the most popular location for women to carry. After collecting data from holster sales and customers, I was very pleased to learn that this has become the first choice for women. The majority, 40%, carry In The Waist, with the holstered firearm carried inside the waistline, in either the appendix position or just off the back of the hip. The belly band came in second, primarily because of its versatility to be worn in multiple ways in multiple locations providing the ability ‘customize’ holster fit and location. Notice in the infographic most women are carrying in the prime zone on the middle of the body, where grasping the firearm is the easiest. On the body carry in a a quality holster is also the safest and best way for you to carry your gun as it also offers limited access to unauthorized persons or children. Regardless of where you carry, your firearm must be holstered and the trigger covered at all times. 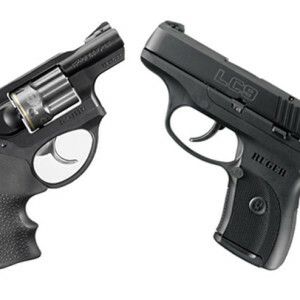 Once you have considered the first three elements of your Personal Concealed Carry System, you can consider and shop for holsters that fit your gun, your body and your clothing. The order is important as the decisions you make in each of the previous will help lead you in the right direction to find the right holster locations and holsters for YOU. As you can see, there are so many variables that go into building your Personal Concealed Carry System and no two will be alike. Because you are a unique individual, taking the time to properly build your system will result in the safest and most comfortable method for you.